ViewSonic Corp. introduces two LED-based, Full HD large format commercial displays with six-point simultaneous touch interactivity. 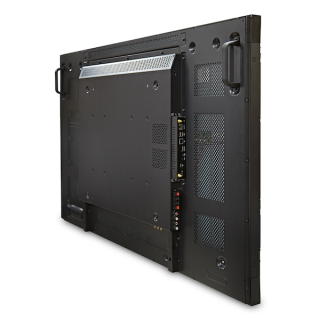 The CDP5560-TL 55-inch display and the CDP4260-TL 42-inch display feature Open Pluggable Specification (OPS) for easy installation, flexibility, and manageability. ViewSonic’s CDP5560-TL and CDP4260-TL displays are fully integrated, large screen touch solutions ideal for interactive advertising, way-finding, surveillance, education, transportation, and hospitality applications. The ViewSonic CDP5560-TL and CDP4260-TL displays are specifically designed for 24/7 commercial use. Both displays are built with SuperClear IPS panels for image enhancement and wide viewing angles. Along with Full HD 1080p resolution and 450 nits of brightness, the CDP5560-TL and CDP4260-TL deliver sharp, vivid images. Six-point multi-touch functionality and a 0.77-inch (19.5mm) bezel on both commercial displays create interactive video walls, supporting up to a 5x5 daisy-chain installation. Both CDP5560-TL and CDP4260-TL include HDMI, DisplayPort, DVI, D-Sub, YPbPr and CVBS inputs for easy installation and control of a variety of HD video sources. The integrated OPS slot ensures straightforward connectivity to external PCs, while the RS-232 with IR pass-through and RJ45 input and output allows network monitoring and control. The displays come with a content scheduling feature that provides a trouble-free management solution. EP5012-TL 50-inch digital kioskAlso, new from ViewSonic are the EP5012-L 50-inch free-standing ePoster digital kiosk; and the EP5012-TL 50-inch interactive four-point touch free-standing ePoster digital kiosk. The EP5012-L and EP5012-TL 50-inch digital kiosks come with embedded media player, 8GB internal memory and bundled with management software for content editing, loading and monitoring, as well as an integrated scheduling function for easy management. These ePosters feature Full HD 1080p resolution and a variety of connectivity options, including HDMI, USB and RJ45 for LAN functionality and network control. Both ePosters feature an embedded Android operating system for customization of vertical market applications.